Judicial Corruption – SBX-211 Cover-up by California Government update | Scanned Retina – A Resource for the People! Clearly part of that passage is misleading and arguably could be called false, as the case of Sturgeon v. LA County, et. al. (2008) 167 Cal.App. 4th 670, rev. denied, in fact found and held that the double benefit payments that the LA County Superior Court judges had been receiving since 1988 were – UNCONSTITUTIONAL – or illegal. Wouldn’t this fact give a reader of the article a totally different perspective on what Mr Fine was doing? On what Judge Yaffe was doing? On what the other courts – at all levels of the Federal and California Judiciary – were doing? Wouldn’t basic journalistic standards require this fact be reported in the article? Of course, as most of you are aware, the LA County judges, led by Chief Justice Ronald George, promptly ran up to Sacramento and submitted a a bill – SBX-211 – to the legislature while they were in an emergency budget session (which forbids them from considering extraneous bills) attempting to deal with a state budget shortfall around $19BILLION. SBX-211 would circumvent Sturgeon , thereby allowing the double benefit payments to continue and also would give retroactive immunity to the LA County officials who authorized the illegal payments and the judges who took them. Before you could snap your fingers, in an almost unanimous vote both houses voted for SBX-211. And before you could blink, the Guvenatror – Ahhhnald – signed the bill. So much for checks & balances. Why does this article (and the similar LA Times article in my e-mail earlier this evening) fail to mention the Sturgeon case? Fail to mention And tBX-211? Ealier today the LA Times published an article reporting that LA District Attorney Steve Cooley (currently running for the office of California Attorney General) had indicted and arrested eight (8) official from the City of Bell for corruption. How is the LA County Superior Court judges getting those illegal double benefit payments – any different? Well, since 1988 those judges took over $300MILLION, the Bell officals $5.5MILLION. The judges are special and clearly neither Cooley, nor Jerry Brown (currently running for the office of Callifornia Governor) would ever think of going after the judges. Nor would Attorney General Eric Holder. Nor apparently the would Met News or the LA Times.. (I’m trying to get LA Daily Journal article on this story to see how much cover they gave the judges. It readily appears they all had no trouble going after Richard Fine. There is no one left to blame but – the judges/judiciary. Liberty & Truth require constant vigllance. GLZ. 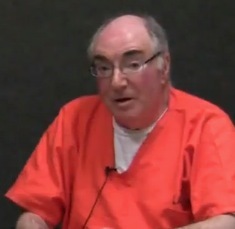 Judge’s order said the contempt-of-court incarceration of Richard Fine, 70, no longer served a useful purpose, given what he called the attorney’s ‘bizarre’ conduct. A Los Angeles judge who had jailed a disbarred attorney on contempt charges 18 months ago released him last week because the attorney was “irrational,” “bizarre” and incapable of making a rational choice, according to the judge’s order. The contempt charges against Richard Fine, a 70-year-old antitrust and taxpayer advocate, arose out of a lawsuit he filed on behalf of Marina del Rey residents fighting a new development in the area. When the state bar suspended Fine’s law license shortly after the case was filed, Judge David P. Yaffe ordered Fine to pay fees and sanctions to the developers and reveal details of his finances. When Fine refused to answer questions about his finances, Yaffe ordered him jailed for contempt of court. Yaffe said Friday in a three-page ruling that the former attorney’s confinement no longer served a useful purpose, given what he called the attorney’s “bizarre” conduct. The judge wrote that any further imprisonment would be detrimental to the public because he is taking up space in an overcrowded jail, possibly causing the release of other inmates who are of more danger to the public. In the order, the judge also disputed Fine’s contention that his confinement was retaliation for his criticisms of the county’s judges. Fine has repeatedly argued in a number of habeas corpus petitions and other court filings that he was being targeted because of his challenges to county-funded benefits that judges receive on top of their state pay. Fine “portrays himself as a lone hero who is being incarcerated because he has exposed a vast conspiracy of over 400 judges of this court …. This contention has now been rejected at all levels of the Federal and California Judiciary,” the judge wrote. The U.S. Supreme Court in May declined to take up the attorney’s case. These are my recommendations. On the Supreme Court ballot, vote no on all justices. All of the justices had received illegal payments from counties while they were Superior Court judges based upon their biographies and the time of the payments. They also received retroactive immunity from criminal prosecution, civil liability and disciplinary action for having received the illegal payments under Senate Bill SBX 2 11. They are not fit to hold office. The same is true for all of the appellate justices running for re election except Crossky. At this point in time, Crossky is probably in his mid seventies and will not serve out a full 12 year term if he is re elected. However, he is clean on the payments issue. None of the people running for Superior Court judge are presently judges. Thus all of them are clean on this issue.